“Um, Mum, we are coming with you, aren’t we? Because (and sorry to have to tell you this), we actually have more fans than you do on this blog. “ * The HH loved this so much, he thought it needed a more jazzy name. So he came up with “Pesto Fiesta Pizza.” Olé! One of the things I decided to do this summer was grow a garden, for the very first time. Maybe it was the influence of the previous tenants, who had one of the most beautiful back yard gardens I’ve ever seen (shame they uprooted everything and took it with them to their new abode when they left!). Maybe it was the billowing mint going forth and multiplying (seemingly by the hour) at the side of our house; maybe it was the current food prices, rising rapidly and steadily like water round a sinking ship. Whatever the reason, I felt inspired to grow my own produce this year. 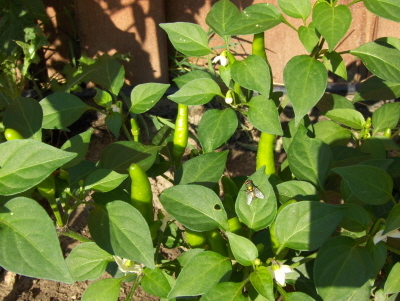 During one of my weekly shopping trips to the local organic market last May, I bought–ta da!–TWO seedlings: one tomato, and one jalapeno pepper. I felt a little frisson of pride as I hugged the green plastic pots and carried then back to the car. I couldn’t help but smile as I dug little holes in the clay that is our back yard, popped in the root balls I’d loosened from the pots, and propped up the little sprouts of life with even more dirt. And then, I waited. Anyway, the first time I tried to cook with these mysterious darlings, I plucked a couple of green ones and chopped ’em up the way I would regular jalapenos. WHOOOO–Big mistake. WHOAH, AGGHHH, WHOOSH, PANT, PANT, DROOL, TINGLE. . . SWEAT BREAKING OUT ON MY BROW—Whoah, Mama, those babies were HOT. And, as someone who loves spicy foods (I generally can eat raw slices of jalapeno without a problem), let me tell you, these are no ordinary peppers. Yowsah!! And so, I am now cooking with these fiery rascals, using them much as I would jalapenos (though adjusting for the extreme heat). I actively sought out any and all recipes that call for hot peppers, as the count is up to about four dozen of the little monsters, and more are clearly on the way. I’ve been cooking everything I can think of, from curries to chocolate cookies to candied varieties (thanks, Diann! ), and now–pesto. This pizza was enormously successful and beyond delicious. It left a pleasant, buzzing tingle on the tongue without chafing. It’s also bursting with protein (beware: not a low-fat meal!) and is probably satisfying for that very reason; the HH remarked, “This doesn’t even NEED cheese.” In tossing the pesto together, I took my cue from Nava Atlas’s Very Green Veggie Pesto mixture, then ad-libbed elements of 2 other jalapeno pesto recipes I found on the web, to create this final version. In the end, it seems, the sum is much greater than its peppers. It may appear as if there’s too much pesto for a single (12 inch) pizza; this is as it should be. I used the entire mixture on one pizza, creating a soft, cushy mattress of green on which I lay the additional accoutrements (in the way of sundried tomato, fresh tomato–from my garden! !, broccoli, red onion, and chopped garlic). If you prefer a thinner base and heavier toppings, then use about 2/3 of the pesto and save the rest to toss over pasta or even steamed cauliflower, as I did. The HH and I decided, in fact, that this pizza would still be superb with nothing other than the pesto and a few stray shards of sliced sundried tomato. I used my standby thin-crust spelt recipe, but use whatever crust you fancy. And since this pizza contained not one, but two vegetables from my very own garden, I’m submitting it to Maninas’s blog event, Eating with the Seasons. A perfect combination of smooth, spice, and protein-rich seeds and beans. A great way to incorporate some extra minerals and protein in your pizza topping! Ole indeed. With all that broccoli on it, I’m sold! my husband would be all over that. I’m a wuss, though. You gave me frissons just looking at that pizza! Oh how I wish that was in my oven for lunch today. I’m a huge, huge fan of the spicy & piquante, but not a pepper expert. They do look a little like what we call ‘Moroccan Peppers’ here in France, but not sure (if they are, that would explain the intense heat). I used to save ‘pizza bones’ (the crusts) for my friend’s dogs – they loved them! Ok, you are my hero. The day Mr. Fish says that the pizza doesn’t need cheese is the day I know I’ll be as cool as you! Oooo wow that pizza looks awesome – love the colours! And I love that there’s so much pesto and that the pizza doesn’t require cheese. AND I love that the pesto recipe is based on edamame and pumpkin seeds! Though I don’t think I could handle your jalapeno version. Wow! That’s a really beautiful pizza. And the recipe is so interesting. I would love to try it. I like the edamame and miso in the recipe. Your pepper plants look terrific. I wish I could grow them here. In Texas we grew jalapenos and the flesh was generally thicker than what I am seeing in your photo. What’s more, when my jalapenos turned red the fire grew milder, though spiciness does vary from pepper to pepper. i’m always trying to find ways to incorporate miso in recipes. j’s nuts about jalapenos, esp. roasted ones. thanks for another great combination of flavours. Hot and fiery – pizza oy vey. It looks like 5 alarm goodness to me. And if you can’t use all the peppers, just pop them into small freezer bags and freeze. They will be just as tasty all winter long. I love how Andrea said to freeze them… i was thinking send some my way 🙂 This sounds awesome!! I’m not really a fan of the bite that jalepenos bring to the table, but maybe I haven’t given them a fair try… That pizza definitely sounds delicious, that’s for sure! You’re right, Ricki. Those aren’t jalapenos, but I don’t know which hot pepper variety they actually are. There are scores of them, and most are generically labeled “hot pepper” in the markets. Doesn’t help that many look similar to each other. Glad you like the idea–though I did say “holy–! !” a few times from the jalapenos! Not a wuss, just differently taste-budded. Maybe try with half the peppers? Glad you like it! I’m sure it would be fine with less/no jalapenos if that’s your fancy! Thanks! I’m of the belief that pizza is good pretty much any night! Glad you like it! And the miso does add a great zing to the flavor. Ov vey is right–quite the bit of flame on the tongue! But we’re just spicy eaters over here at DDD. Thanks so much! Of course I hadn’t even thought of freezing (duh? )–great idea. Thanks! Wish I could send some on over! But freezing will have to do, I guess. Spicy is definitely an acquired taste (or at least it has been for me)–I’d give this a try with maybe just 1/2 a pepper in the whole thing and see how you like it, then build from there! Ole is right!! How cool that you are growing your own peppers! I am no big on eating them raw, but my husband is so I wonder if he could handle the heat. That pizza looks awesome. That looks amazing! You are making me so hungry 😛 You are also making me realise that I need to be more adventurous with my pizza! *drool*… Ricki this looks incredible! Totally restaurant-worthy! Sorry to make you hungry! (Or maybe that’s a good thing?). I learned to be adventurous with pizza when I was on a regimen that didn’t allow cheese. . . now I just think of it as a big, open-faced sandwich! Thanks so much! (Ah, if ONLY I could serve this in my own restaurant. . . *sigh*). SUCH a beautiful pesto, packed with an abundance of “good stuff” – your high-nutrient pesto could easily become a staple in a kitchen… Such as ours, perhaps… 😉 I can’t wait to fix a batch and try it on everything! I love the idea of kale on a pizza. Those don’t look like jalepenos to me, but I don’t know! What a fantastic flavour packed pizza! There is nothing so satisfying as growing your own ingredients is there? I had much success this year even on my little balcony!